While many people may think that a basket of magazines or a scented candle are the only options to decorate a toilet, many design companies have begun to branch out and find ways to dress up these typically boring appliances. Jewels for the Loo® has created a line of bathroom accessories that are designed to dress up your toilet and give it a unique accent. 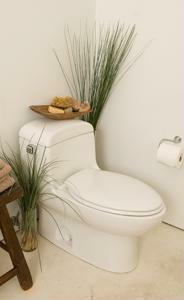 The company offers a line of colorful bolt covers that can add a personal touch to any toilet. Even on the most expensive toilets, the bolt covers are most likely an afterthought and are kept uniform. Jewels for the Loo® aims to change this convention in bathroom design by offering a wide range of colorful and intricate bolt covers that will impress your guests. They are made out of ceramic and can be found in beautifully carved fish designs and many other elegant shapes. Ideas like these are just the kind of outside-the-box thinking that can make a huge difference in the look of your bathroom. Small pops of color in unexpected places can help you bring a unique aesthetic to your washroom that people are sure to admire.